Thomas Goodwill (1894-1916) was born in 1894 in Seaton Delaval, Northumberland and died in France on 1 July 1916. A former coal miner, Goodwill was a gifted outside-left who played 60 games for Newcastle United before losing his life on the opening day of the Battle of the Somme. Goodwill began his career at local amateur side Seaton Delaval before joining Newcastle United for £100 in May 1913. Initially bought as cover for first choice outside-left George Wilson, Goodwill soon forced his way into the first team and would eventually play 19 games during the 1913/14 season, scoring twice. 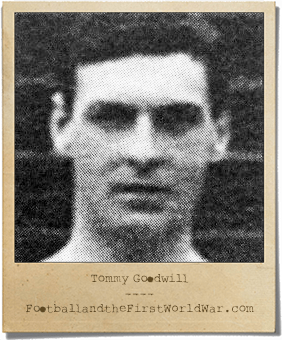 The 1914/15 campaign saw Goodwill firmly establish himself as a first-team regular, with the popular 20-year-old playing 34 league and seven FA Cup games. He would also score two league and three cup goals as Newcastle finished 15th and reached the fourth round of the FA Cup. Goodwill played his final game for Newcastle on 28 April 1915, a 3-0 home win over Aston Villa, before joining the British Army with a number of his teammates. Private 28/159 Goodwill enlisted in the 16th (Service) Battalion of the Northumberland Fusiliers, also known as the Newcastle Commercials, in mid 1915 and underwent training; first in Yorkshire and then on Salisbury Plain, Wiltshire. The battalion, which had been raised in September 1914 by the Newcastle and Gateshead Chamber of Commerce, landed at the French port of Boulogne on 22 November 1915 and eventually moved into frontline trenches for the first time. On 1 July 1916, the opening day of the British offensive north of the River Somme, Goodwill’s battalion were tasked with capturing ground to the south of Thiepval, a strategic village that had been heavily fortified by its German defenders. The advancing commercials met fierce resistance as they crossed the exposed slope and were to sustain heavy casualties for no gain. Among the dead was Pte Goodwill, killed at some point during the day alongside another player on the books at Newcastle United, Dan Dunglinson. Goodwill’s body was subsequently lost and the 22-year-old’s name is now among the 72,195 recorded on the Memorial to the Missing of the Somme at Thiepval.